Boy, did that go fast. At this time last week, the ship was leaving Miami on its way to Grand Cayman. We had a great time. Missed the girls, especially towards the end of the trip, but I have to admit that it was so very nice to do the things that we wanted to do, when we wanted to do them. Never in a million years would we have been able to take the girls ziplining in Belize (yes, that’s me in the photo) or take a 7-hour excursion to see the Mayan ruins in Tulum, Mexico in 100+ degree heat. That gorgeous beach in the photo above was the view from the ruins – it’s no wonder the Mayans considered Tulum a sacred site. The setting was breathtaking. We enjoyed the cruise itself, even though it was very crowded. 3600 passengers, 1/3 of whom were kids. How nice that none of the 1,200 children was our responsibility! – Trying snuba for the first time in Grand Cayman. A cross between snorkeling and scuba – we were able to dive about 20 feet below the surface of the water and see a shipwreck. The oxygen tank was on a raft floating above us and we breathed through a hose that was attached to the tank by a very long cable. 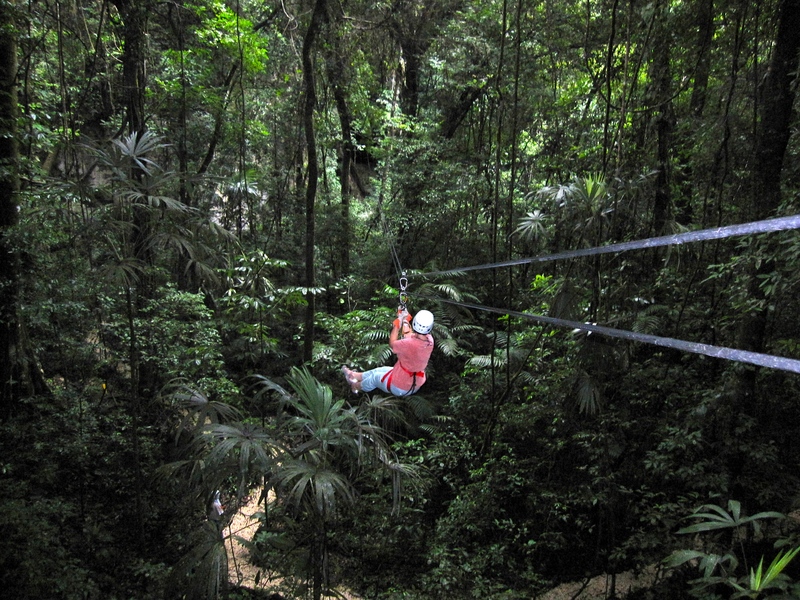 – Ziplining in the Belizean jungle. Very cool. Very fast. Very high. I was a little disappointed not to see more wildlife, except for mosquitoes. – Not getting eaten alive by the mosquitoes while ziplining. In fact, not one bite. That’s never happened to me before – I’m usually their dessert. Our avoidance of a mosquito attack was entirely due to my super-duper chemical Deet spray. – Spending quality time with the hubby. 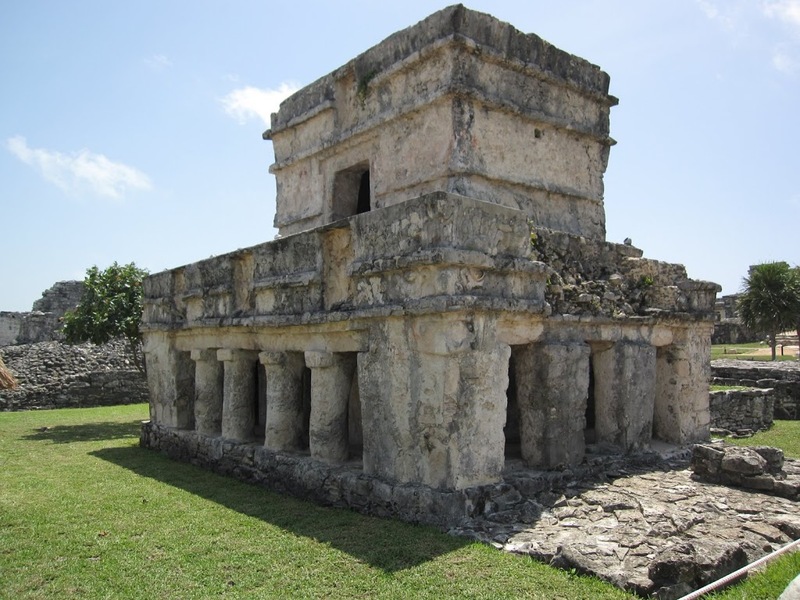 – The Mayan ruins in Tulum – as I said, just a beautiful setting. But so freakin’ hot. We took a ferry from Cozumel to Playa del Carmen on the mainland. There were lots of new hotels there and it would probably be a great place to take the kids. – Placing third in the cruise’s blackjack tournament. Came very close to winning $500, but got slammed with a horrible last hand. Oh well. It was fun while it lasted. And I did win some tacky Carnival giveaways. – Getting a facial and a massage. How relaxing! – Leaving work and everyday stress behind. Tomorrow we reunite with Sophie. Yeah! Chloe is with her great-aunt and great-uncle for another week, attending day camp there. I’ll fetch her next weekend. And I can’t wait to see them both. Because as much fun as it was to get away for the week, it’ll be really nice to give them hugs again.